Jeff Burger holds fifth-degree black belts in both Shito-Ryu karate and Matsukazi-Ryu ju jutsu. He is a muay thai instructor, trained and certified at Muay Thai Institute in Thailand, who competed in the 2006 Muay Thai World Championships. He is a Chinese Boxing and Tai Chi Chuan Sifu, trained and certified in China. He has studied stick, knife, and firearms with Hock Hochheim (Force Necessary) and Avi Nardia (KAPAP). 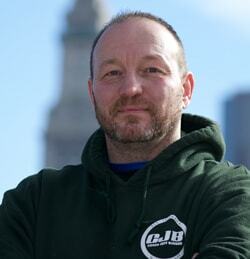 Jeff Burger teaches martial arts and self-defense in Salem, Massachusetts.